I found this recipe in the December/January 2011 issue of Simple & Delicious. The original recipe uses barley, but I decided to use quinoa instead, it makes the dish just a little lighter. This casserole is so yummy and jam packed with nutrients from super foods like spinach and carrots. This is a nice change from your everyday casserole. It was a huge hit with my family! You can freeze this casserole for up to a month. You can serve this to your whole family starting at 10+ months for finger food, or you can puree it for little ones 8+ months. Preheat oven to 350F. Cook quinoa according to package. In a large skillet, saute the mushrooms, carrots and onion in oil until tender. Add garlic and cook for 1 more minute. Transfer to a large bowl and set aside. In the same skillet, cook sausage over medium heat into not longer pink. Add mushroom, carrots and onion back to skillet. 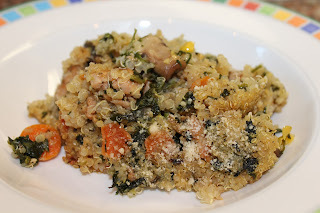 Stir in the quinoa, corn, spinach, Italian seasoning and pepper. Transfer to a greased shallow 2 qt baking dish. Cover and bake for 40 minutes. Sprinkle with cheese. Bake uncovered for 5 minutes longer or until cheese is melted. Let cool and serve. If you are pureeing this for your little one. Place your little one's portion (4 to 5oz) in a food processor with a little water and puree until desired texture.